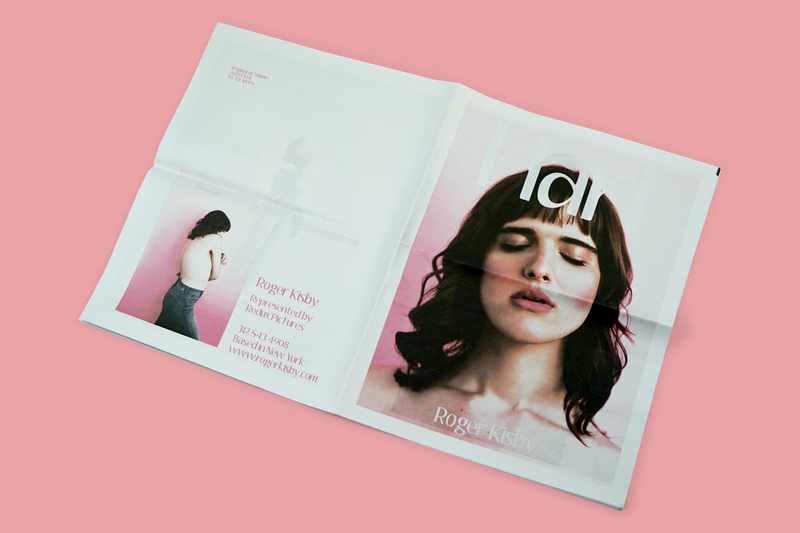 It's no surprise that Roger Kisby's promo caught our eye – the New York-based photographer has shot attention-grabbing campaigns for clients such as Apple, Converse and Gap, and his photographs regularly appear in publications from Rolling Stone to The New York Times. We love his images of actress Hari Nef, shot for a Boston Globe story about models who are "more than just a pretty face." Kisby's portrait made the cover of Globe Magazine's Fall Fashion issue last year, and was singled out as one of art director Greg Klee's favourite covers of 2016: "This cover is a good example of the design philosophy that when you have a great image the type should get out of the way," he said. We asked Kisby about the photoshoot, which nearly didn't happen amidst the chaos of New York Fashion Week, and why he chose newsprint to showcase his images. 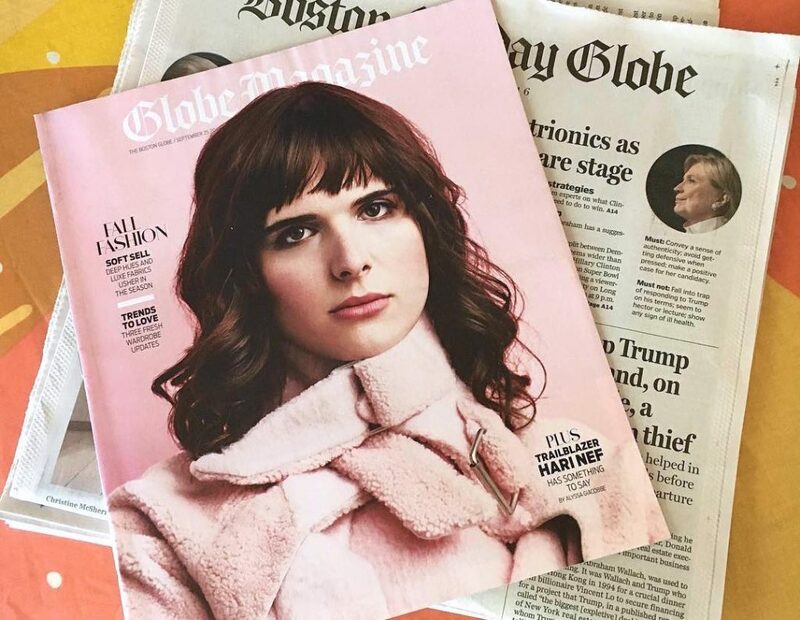 Cover of Globe Magazine with a portrait of Hari Nef shot by Roger Kisby. Could you tell us a bit about your shoot with Hari Nef? Do you have a favourite image from the series? This came together last minute during Fashion Week in New York, so half of the accomplishment was just making it happen. Hari was obviously very busy for FW but was able to shoot in the morning of the first day. We shot at Attic Studios in Long Island City, where we could use the roof and the daylight studio. They wanted a soft, feminine and classic look so we shot in the morning sun on the roof, used window light for the cover image and some classic studio lighting for the rest. The stylist brought a bunch of options and Hari picked what she felt most comfortable in. My favorite image is the cover of the promo. Even though it was a fashion shoot I like that she isn’t wearing anything in the image. She looks vulnerable yet comfortable and beautiful. How often do you send out printed promos? I work with my photo rep, Laura McClintock at Redux Pictures, to try and send out a promo at least every quarter. If I’ve worked on something particularly interesting we’ll send out a promo to showcase that work. Such was the case with the Hari Nef promo. Hari photography promo by Roger Kisby, printed as a digital tabloid. Why did you choose newsprint for this promo? We had been talking about doing a large format newsprint promo for a while. We wanted to send out an impactful piece that told a story and showed more than 1-3 images. There is something undeniable about seeing an image in large format with multiple pages you can turn. But we didn’t want to do a newsprint promo just for the sake of doing one – we wanted it to be for the right project. The Hari Nef shoot was a cover story for the Boston Globe and a big profile project for me, but the magazine runs just 3 images. We felt there was more to show. Plus a large format piece with a transgender model for a subject seemed unique. Did you work with a designer? How did you put this promo together? Laura is great at putting together promos in a short amount of time – all the credit goes to her. We talked about what kind of promo would make sense, what the edit, the tone and color should be and she put together a design quickly for me to respond to. If it was up to me it would never get done. Your work is published in newspapers like the New York Times and the Boston Globe. Is there a different approach when you're shooting for newsprint, as opposed to a magazine or online feature? If the images are going to appear in a magazine, I’ll talk to the editor about composition. For example, for a cover image I need shoot vertical and leave space for copy. If I’m shooting a general editorial piece, say for the New York Times, usually I shoot what I think fits best for the story. I’m going to be putting together a promo of groups of seniors from across the US that I photographed for AARP. The group activities of these seniors range from cheerleaders to synchronized swimmers to actors. Its going to be a fun, inspiring piece. 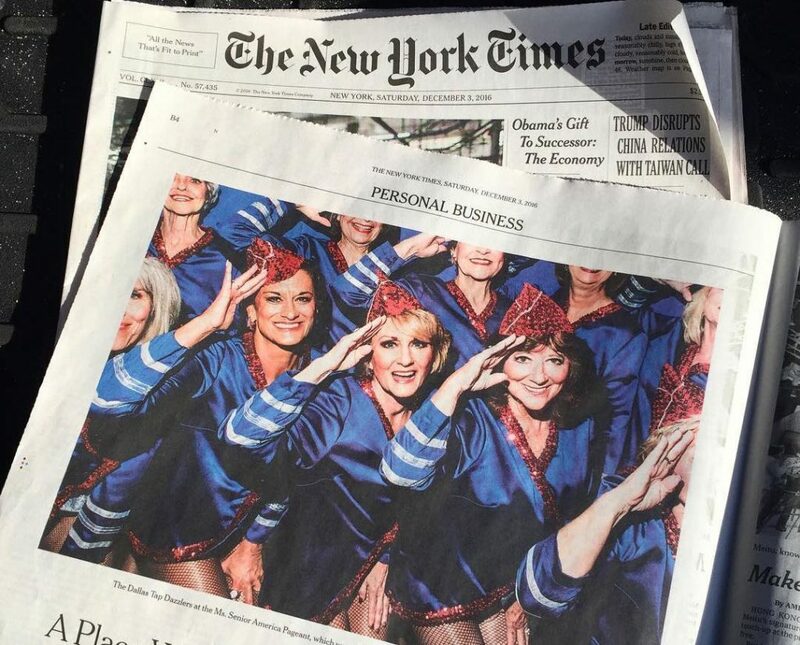 A photo of the The Dallas Tap Dazzlers at the Ms. Senior America Pageant, shot by Roger Kisby for the New York Times. Check out more of Roger Kisby's recent work on his Instagram. Next up: We're taking a look at sports photography in newsprint and sharing some of our favourite examples – from portraits of tennis player Serena Williams to the US men's water polo team and more. Have a question about printing photography in newsprint? Tell us and we'll answer it in our Q&A at the end of the week!